With so much information to factor in, choosing a University can be tough for students. Campus visits, also known as open days, give students a real feel for what a place will be like for them to live and study at. Data also shows that a student attending a Campus Visit has a 80% higher chance of applying. But they can be hectic and the day flies by, even if prospective students and their parents have done some preparation beforehand. 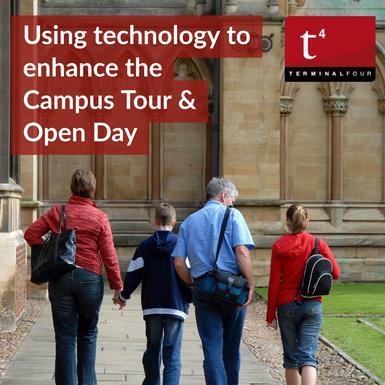 Here we take a look at how technology can support and enhance the open day experience, what Universities are doing to innovate in this area, and where today's open day app sits within the wider digital context. A search of the available apps on the Google Play and Apple app store shows many Universities and Colleges are committed to building apps for campus visits into their digital offering. The benefits for students and parents of having a dedicated app are numerous. They can plan their day and transport in advance, register for an open day, sign-up for talks, and use the app on the day to keep tabs on what events are happening and how to navigate to them. Institutions also benefit by building a genuine connection with prospective students and other decision makers such as parents. Personalised content can be delivered based on course preferences, extra curricular interests, and accommodation requirements for example. And push notifications can be used to get the attention of prospects at the right time prior to and during the day. With the app remaining on their phone as a widget it also remains front of mind. But with browser capabilities increasing all the time the gap between browser and app is closing all the time. Universities are therefore having to weigh up carefully the benefits of a developing a dedicated iOS and/or Android app and maintaining it versus offering a web app or webpage content. What are Universities doing with their native and web apps for campus visits? In the US, campus visits are well served with both apps and website experiences. Yale, for example, has a rich native app for iphone and ipad which provides walking tours with photo content at each stop, turn-by-turn walking directions and campus route options. Current undergraduates narrate the tours. Meanwhile Duke University uses Google Earth to provide 3D renderings of the entire campus and enabling you to search via interests, dining, libraries, parking and accommodation. In Australia, the University of Wollongong has invested in creating 'day in the life' content to give a snapshot from a student's perspective of living and learning there. And in the UK, Bournemouth, Birmingham, Liverpool, Manchester, and Southampton University use feature rich native apps providing a dashboard with quick access to upcoming open days and interactive timetables, virtual tours and maps, accommodation tours as well as testimonials and the opportunity to chat with staff about applying. With so many presentations, talks and drop-in sessions on offer, some of the most powerful applications are the timetable and scheduling, to enable prospective students and parents to organise their day and to book talks and events, and the interactive maps to help with wayfinding and orientation. Academic orientated content is also particularly important. Prospective students expect easy access to course information, video content of lectures and tutorials, student testimonials and real time content with student ambassadors. With students investing their attention and getting the benefits from the app they've downloaded and having push notifications set up, it really makes sense to continue the connection with students and their parents. By gathering feedback or providing useful information at key points in the recruitment journey - clearing and application deadline reminders for example. Most features are currently time-bound to the open day and the period just before it. But some of the best apps stretch this usefulness from the lead up to the open day to far beyond the open day itself. They often house the open day functionality within a 'MyUniversity' app which also delivers functionality for existing students. The benefit is this provides a single entry point but the trade-off is the app can be harder to find and has more 'noise' in terms of it serving other functions. The alternative is having a dedicated app for campus visits in which case it's important to deploy clear hand-offs into other services such as freshers week apps with notifications to signpost students to the right digital resources and tools after the campus visit has concluded. Of course, not everyone can reach the University open days or campus tours, either for time, cost or geographic reasons. This is particularly true for international students, who make up an increasingly important proportion of the student body. We know they welcome easy access to support staff through their open day experiences to help answer queries about accommodation, fees and visas as well as information on living in a different city and what it has to offer to help them really feel comfortable with their University decision. 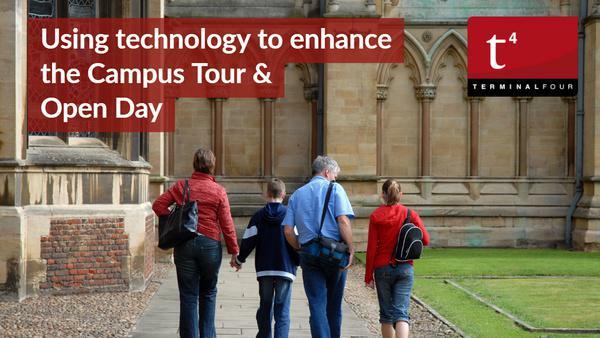 Beyond this, virtual open days attempt to fill the gap by creating an actual online experience of the campus with 360 degree images and video, offering webinars, virtual Q&As and online hosted events. University of Birmingham & the Unniversity of Kent for example provides an interactive map with virtual tours of each area of the campus enabling students and their parents to view inside lecture halls, classrooms and accommodation. Elsewhere, some virtual tours run on google maps technology. Increasingly institutions are finding that it's not just people located a long way from campus who benefit from virtual open days but also people actually making campus visits. This is either to get a feel for the campus offering in advance of their visit or to fill in the gaps in their knowledge following their visit or to back up their perceptions of the place. In fact it seems likely that students who access the virtual tour and are able to attend will be much more likely to follow-up with a visit if they have had a good digital experience through the online tour. Gathering and acting on data is the future and will make apps feel more conversational and natural. Increasingly Universities are utilising real-time analytics to optimise their events and leveraging attendee data to provide relevant marketing follow-up activity. In the context of a campus visit prospective students are willing to provide information on the courses they are interested in, what extra-curricular activities they want to pursue and the other aspects of the University they're interested in finding out more about. Based on these details students can then be sent updates on their courses of interest, and invited to connect with a lecturer for example, or to hear from student ambassadors and students already on their course - providing real tangible engagement at the point when it's needed. Data and analytics both during and following campus visits will become crucial. Naturally, this is more easily achieved online than offline, but feedback mechanisms can be successfully interwoven in the on-campus experience. And by combining offline and online data Universities will have a detailed individual level view to create personalised communications and also the top level data to improve the quality of information and experiences. Social media is another channel providing prospective students with further insights into the personality of a University and whether it's right for them. Seattle Pacific Univesrity have produced an amazing Google 360 Video tour of their campus. Grab your 360 glasses!! It's also an opportunity for Universities to bring their city to life and to showcase the beauty of the campus through the seasons or to draw out the little details so easily missed on a short visit. There are so many opportunities to create social media initiatives interwoven with campus visit and virtual campus experiences. Over time we'll see more social media feeds being incorporated into other campus visit content and live social media content featuring throughout the day around campus. But what else does the future hold for open day apps and virtual open day experiences? Campus visits remain a crucial conversion area for Universities. Over time they are set to become more and more immersive with greater prominence of augmented reality applications supporting wayfinding, and information provision on campus and virtual reality increasing in use for virtual tours online. Social media can provide a trustworthy credible voice and also looks likely to feature in real-time events more commonly. And campus visit experiences will become more personalised and tailored to the individual based on increasingly detailed data analytics. With web apps increasing in sophistication, can the same experiences be achieved in the browser to avoid the higher development and maintenance costs associated with iOS and Android apps? Is there any correlation between the quality of the digital experience prospects receive on campus visits and the overall quality of digital service provision they'll have throughout their time at University? And is the commitment a University shows to technology in the open day experience a subtle additional decision making factor for students?